Put simply, Headless CMS is an alternative to traditional website content management systems. Headless CMS isn’t brand new, the technology has been around for a while, but more and more clients are now asking what it is and if it’s something they should consider for their business. As businesses shift more of their focus to their website content, Headless CMS is becoming an increasingly popular choice. Who is using Headless CMS? Excellent examples in the application of Headless CMS can be seen across a range industry sectors, a couple of strong examples are the ‘Institute for Sound and Music Berlin’. It is a non-profit organisation dedicated to the history of Sound, Immersive Art, and Electronic Music. A Headless CMS solution was chosen as it supports a wide variety of channels, including a range of on-site exhibition display screens. Giving content creators the opportunity to tailor content specifically for exhibition spaces. Headless CMS allows for tailored presentation on a variety of screens and devices. Another example is a Careers website for an international agricultural wholesaler Kramp, www.careeratkramp.com integrated seamlessly with the HR system improving internal efficiency for administrators – all necessary changes made via the HR platform were automatically updated on the website. As a Kentico Gold Partner we stay up to date with their latest research, in their ‘State of Headless CMS Market 2018’ report they noted that Headless CMS is on the rise and adoption is expected to double this year. However there is still confusion surrounding what the term means. Below we hope to clarify ‘what is Headless CMS’ and what the benefits of choosing it over a traditional CMS are. In a traditional CMS, the site architecture combines a front-end (visual design and layout) with a back-end (code and content database). The front-end layer offers built-in themes and templates that can be customised. Traditional CMS platforms were built predominately for serving content for websites, rather than smart watches or digital assistants and therefore the content, editing interface and custom code was held within a single environment. WordPress is one of the most popular traditional CMS options. Traditional CMS is by no means obsolete, for lots of websites it is the best fit CMS platform. The main benefits are that it is relatively easy to set up and manage. For example, if you have a brochureware website that doesn’t need to be published across multiple devices. Headless is back-end only CMS, it does not utilise a presentation layer (front-end) to determine how content will be displayed. Instead, it acts as a content store, which makes content accessible via an Application Programming Interface (API) for display on any device or platform; website, mobile applications, smart watch or digital assistant. 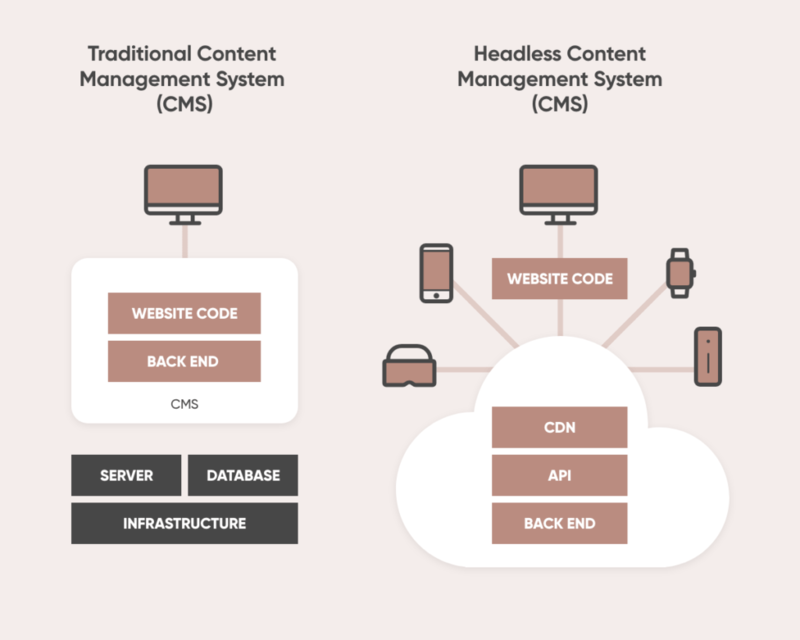 The diagram below illustrates how content delivery differs between traditional and headless CMS. Content first, omnichannel approach – content created in a headless CMS can be repurposed across multiple channels – website, mobile app, smart watches and digital assistants. Greater control over how content is rendered on multiple devices, as content is not forced into prefixed themes or layouts, allowing it to be presented in the best possible way for each specific device. Decreases the amount of manual intervention required from Development teams, increasing efficiency of development projects. Simplifies content migration from old to new sites – by nature headless CMS is ‘future proof’ as it integrates with new technologies and applications easily. Aids website redesigns – headless CMS allows content managers and developers to work simultaneously which speeds up project timelines when redesigning or developing a site. Thinking of updating your CMS? Choosing a CMS for your website project is really important, when discussing CMS options with clients we look at a number of factors before making recommendations. functionality – what functionality does your site need? For example; CRM/ ecommerce integration, Event booking system, Newsletter sign up or contact forms. support – if something goes wrong is there a support resource you can rely on to help? future proofing – ensuring the chosen CMS allows additional features and functionality can be added. usability – is the CMS easy to use for users within your Business? Wondering which CMS is right for your next website project? Contact our Client Services Team and we’ll be happy to discuss your website requirements and recommend a best fit CMS.